1. Hi Shmulik, thanks for agreeing to this interview. Please tell us a little bit about yourself and your background on the Internet. I have 10 years of experience in the web industry. Together with my partner Tzvika Steinmetz, we’ve founded and headed two other successful companies, a web agency and a web marketing company. 2. When and why did you create Webydo? We were leading a big web agency and felt frustrated by the fact that majority of the website creation budget is going towards the tedious, repetitive development of handwritten code (close to 70% of budget). In order to create a professional website, designers need to convert their graphic design into HTML code, usually by hiring developers. This process (which hasn’t changed much since the 90s) is very slow and expensive. Designers are marginalized and there’s no direct communication between designers and their clients. We wanted to empower the 38 million graphic designers worldwide and provide them with total creative freedom and independence. With Webydo these designers can create sophisticated business websites on their own in a process that is ten times cheaper and faster, without writing even one line of code. That’s a real revolution. At first we’ve developed the Webydo solution for our own web design agency. But when we realized the power of this technology, we’ve decided to share it with the design community. Our mission now is to put designers in the driver’s seat of professional website creation. We offer the Webydo solution free of charge. Designers can design a website, and as many of them as they wish and host on our sub-domain. Once the designers’ clients approve the site, they can choose a premium plan with our advanced cloud hosting and management tools (CMS+SEO) for $9.99 a month. 3. How do you differentiate Webydo with other online website builders? 74% of websites today are created by developers in a professional process. Only 3% of websites are created by DIY website builders. These site builders offer great selection of templates and are commonly used by people who are looking for a fast, fun and easy solution for creating a site. However, the needs of professional designers who create an average of 3 websites a month are radically different than the needs of people who create only one simple website for themselves. Every feature in Webydo was created in order to fit the needs of professional designers. Designers are used to working with professional softwares like Adobe’s Photoshop or Indesign, and they need professional tools in order to create custom tailored web design. DIY website builders are not suitable for professional designers. Designers need a CMS for direct dialog with their clients, a dashboard to handle all their clients’ sites, they need a billing system, etc. Webydo provides designers with a full professional solution, helping them conquer the market. Now a business website that can cost $5,000 -$10,000 is created by a designer, without wasting time and money on development of code. Webydo’s online software has an open canvas that allow designers to start designing a website design from scratch, with no limiting templates, just drag and drop. With Webydo designers enjoy the same freedom they are used to when designing for print. Webydo’s online software provides everything a designer need to create a pixel perfect website – a grid generator, smart guides and snapping, layers window, text caption for images and galleries, forms generator, etc. While designers drag and drop, Webydo’s innovative code generator automatically creates a functioning website with a built-in content management system (CMS) that helps designers and their clients in the ongoing management of the site. Webydo also offers great SEO tools, and advanced cloud hosting, enabling designers to build a fully independent online business. It is important for us to empower designers. We believe it is time that web creation will be lead by the creative minds. We are living in an era of design. Good design has become the key driver in creating value and establishing competitive advantage. 4. What were some of the biggest challenges you faced when working with Webydo? 5. What communication and collaboration tools do you use to work with a company that is spread out across the globe? 6. What advice would you offer to young entrepreneurs looking to establish themselves in the online world? Stay focused! We managed to build Webydo on a limited budget by choosing to focus on one mission at a time. That was a great challenge because the minute our mathematicians managed to create the algorithm that is behind our innovative code generator, we realized that this technology could be used in many different fields. But our focus on the needs of graphic designers in professional web creation was crucial in being able to develop a powerful solution. 7. Do you have any future plans for Webydo that you’re able to share with us? 8. Do you have any other projects or ideas that you are developing, launching in the near future? Webydo is my only focus. Webydo revolutionizes the way websites are created and I believe that now that designers have the power in their hands they will create a better web for us all. Fascinating interview. I have to agree with many things said by Webydo’s CEO about the state of the market. This is the first time I hear about Webydo’s professional solution and I’m eager to give it a try (we currently use in-house developers, we would love to save time on code development). Just played with the Webydo online software, looks fantastic so far! As with all DIY website builders, the quality of websites made with this tool are not near the quality of a website build by a developer. The website’s code is not W3C valid, is bloated with extra, unnecessary code, and has poorer SEO than hand made code. No DIY tool can do everything a developer can, and DIY tools provide little if any knowledge and experience on web development necessary to build an effective website. However, on a constructive note, this tool does seem to be better than most DIY tools. Thanks for posting this interview with our CEO Shmulik. We built Webydo to empower designers who either don’t have time to code, or to don’t know code in order for them to focus on what’s important – the design. If you have any suggestions on how we can improve Webydo – we would love to hear from you. Just post it in our Participate Page. If your suggestion gets enough votes, it will go straight to our development team. That’s awesome Gabriel! If you have any questions or are interested in taking a free tutorial session from our training and support manager, send me an email at community@webydo.com and I’d be happy to help. Thanks for the constructive note. 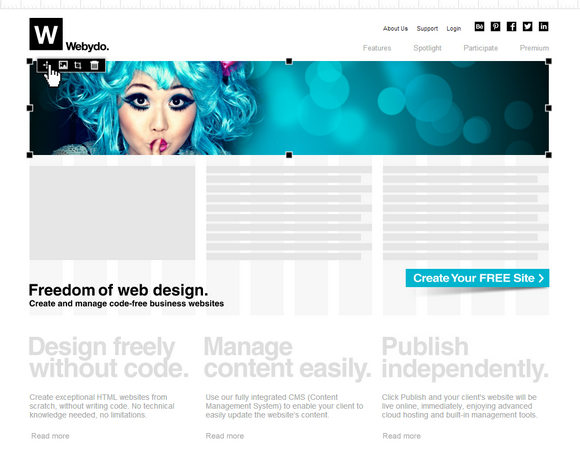 To answer your concerns: Webyo is a professional web software for designers and not a DIY tool. We produce a W3C valid code that is constantly updated to industry standards, cross-platform and comes with built-in SEO management tools.